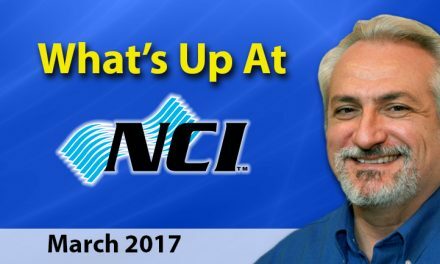 Welcome to NCI’s High-Performance HVAC Today Newsletter. It’s hard to believe summer is now in the rear-view mirror, and the fall season is upon us. Hopefully you’ve already put your Fall and Winter Marketing into action to keep your team busy and cash flow steady all the way into 2018. If you need some help putting your marketing into high gear, be sure to contact Connie Conklin here at NCI to learn how ContractorsImage™ can boost your marketing efforts with Newsletters, postcards, and much more! Special prayers go out to our brothers and sisters in Texas and Louisiana as they pull together to overcome the devastating effects of Hurricane Harvey this week. To our contractor members and friends affected by the storm, please let us know how the NCI Membership family can help. We’re excited to announce NCI’s Summit 2018’s official theme, “Blaze Your Trail To High Performance.” This year’s theme is more than a catch-phrase. It truly embodies the spirit and goals of this important event on March 4-6, 2018 in Austin, TX. All six of our featured Breakout Session Leaders are Performance-Based HVAC contractors who are trailblazers in their own communities. These six outstanding contractors will each share a different aspect of selling and delivering high performance HVAC systems with a special focus on Air Upgrades – the latest “product” NCI has helped its members and students deliver to end customers. Air Upgrades are designed to surgically address and solve many indoor comfort, air quality, safety, and energy efficiency issues in homes and buildings. We have a lot more in store for you next March, including great general sessions, roundtable discussions and a fantastic trade show. 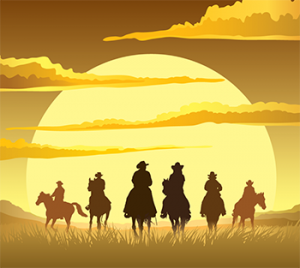 Also, our next Summit coincides with an incredible Music and Film Festival in Austin, Texas called South-By-Southwest, which begins as our Post-Summit training wraps up on March 8th. Click Here to register today and take advantage of our special Early-bird pricing. Be sure to check GoToSummit.com often for updates. 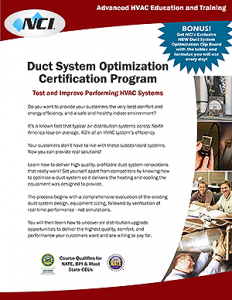 NCI’s brand-New Duct System Optimization class is the perfect entry level performance-based training for managers, salespeople, service technicians, and installers. The new two-day certification class was designed to help you learn how to design, sell, and deliver high quality, profitable duct system renovations and redesigns that really work. Whether you are new to testing and diagnosing HVAC System Performance, or already a Performance-Based company, this class fits the bill for kick-starting your company in airflow testing, diagnostics, and selling solutions that will delight your customers. The process begins with a comprehensive evaluation of the existing duct system design, equipment sizing, and verification of real-time performance. 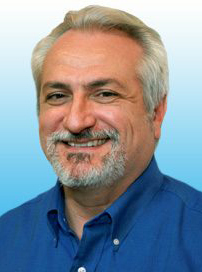 You will then learn how to uncover air distribution upgrade opportunities and redesign and renovate systems to deliver the highest quality, comfort, and performance to your customers. This training also qualifies for 16 NCI re-certification hours, and fills the prerequisite for taking NCI’s Residential Air Balancing class. Be sure to check our Fall Schedule for a Duct System Optimization class near you! Please join me in welcoming NCI’s newest addition, Christie Bedocs. Christie is NCI’s Human Resources Manager, Events Coordinator, and my executive assistant. She now manages all travel for our instructors who make their way across North America – and beyond, to bring you NCI training. Christie is also responsible for travel, logistics, and trade show events including NCI’s Annual Summit. Christie comes to us from a long and successful career as an executive assistant and events coordinator for both private and public organizations. We are excited to have her on board. Be sure to take a minute to get to know her at Summit next March. Have a safe and profitable Fall Season!